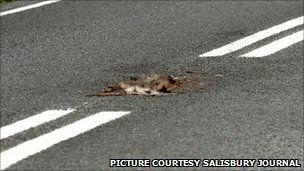 BBC News – Hampshire workmen paint white lines around dead badger. Hampshire County Council said the workers did what they thought “was best” because it is the district council’s job to remove carcasses. Businessman Kevin Maul was on his way home from work when he noticed the break in the lines. He said: “I couldn’t quite believe my eyes when I saw this poor old badger who had been there over a week. “I’d seen him every day as I went by and wondered if he was going to be picked up. This entry was posted in Funnies, Hot Off The Presses by ginny. Bookmark the permalink.